In order to prove that our past should not condemn our present and future, the good Captain sets out to show the goodness—and more importantly, the progression, of Mankind to his accuser. In the end, he proves that Humanity has indeed progressed, and will progress, but to what—as the last episode of Star Trek: The Next Generation will tell, remains to be seen. A universe where all powerful beings who can shape and reshape the fabric of time and space, who spend all their time toying and testing with the intelligent lifeforms of the universe; a universe with beings such as these, but lacking a God, an all powerful being, and the progress of Mankind appears simply to be progression itself. 1963, a hot August day in our country’s capital, a prominent Doctor and Reverend’s speech explodes into a passionate rant about a dream; of talks of freedom, of justice. And what was that dream? 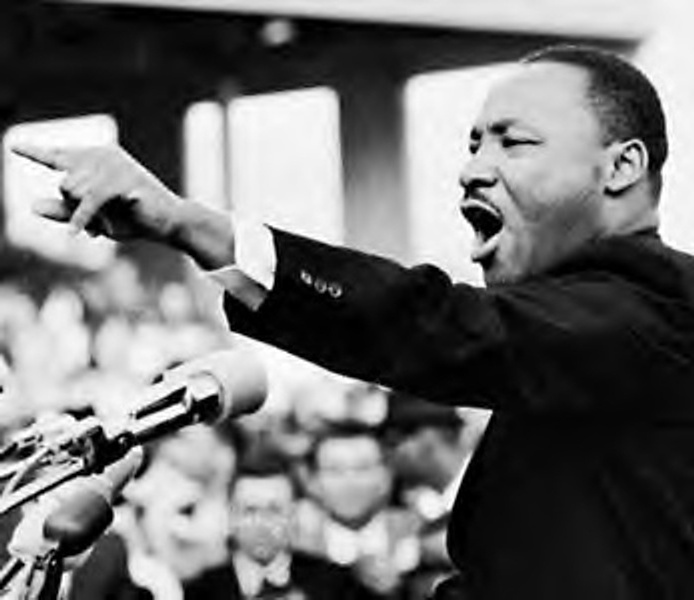 Dr. King stood, a man many believed opposed to racial discrimination. I would disagree. He stood opposed to it only for the fact that he stood for something he believed to be right—an equality of men among our nation. A right and a wrong. In England, in taxation, in slavery, and what should be seen in God’s sight. Our fight has turned from what is right, to fighting for my rights. The government and all those disconnected from us can do as they please as long as it doesn’t impede on our rights to pursue our own individual wishes and happiness. As per my own personal feeling about it, I think, is that a nation in which all one’s wishes were fulfilled would—quite apart from disappointments, be an unpleasant nation to live in. The world would be too like a dream, and the dream too like a nightmare. The dilemma with this has been, and will always be the absent representation of what is right. Even in the far distant future, if man was put on trial, the only defense of wrong doing would be progression from that wrong doing. Yet while progression from is quite clear, it the progression towards that gets murky. For if you begin with a void, to fill it with more void will leave you finding yourself fighting straw horses—of windmills, of an infinite array of human evolution, of progress, of onward and upward. And to what? Who defines human perfection when it’s based on the thing evolving itself? Did the Neanderthal expect to evolve into something superior to itself? Or no, of course not, those proponents of this would say that it hadn’t evolved to the point of recognizing progression and evolution. For those that believe this, I would posit that what’s to keep us from evolving to a place where we recognize a mystery outside of ourselves that judges just when we’ve reached the end of the road? What’s to say we won’t progress right out of progressive thought? But to say there is nothing at all is to say there is nothing to fight for—save for the right to fight, to progress, which—time may prove to be no right at all. To have a hint at something outside, though it may remain a mystery—nay, the mystery, is to say there not only is a purpose, but a right way of things—and by consequence, a wrong way of things, and thus, something to strive for, and to fight against. Dr. King seemed to understand this fact. His famous speech is riddled with Spiritual references to a Creator God not because he was a Reverend, nor because he thought it would help drive home the point of the movement, but because they were so intertwined that the lines separating them could not be easily discriminated. I’d love to be in the hope that the reason there has been none like him since is that all the great causes to fight for have been, and been won. But with Gay Rights, Occupations, Ron Pauls, Tea Parties, and the like, I don’t know how verily that can be claimed. So where has this disconnect come? Why are there no more great Civil Rights movements when it still feels as if Civil liberties still have something to be desired? What’s lacking before we march on the Capital once more? What vanished on our way to the Capital? Could the divine we’ve “fought” to progress past, beyond, be the very thing which progression herein depends? Here again it seems obvious that all the doubts which legitimately attach to the idea of a progressive humanity are absolutely fatal to the idea of progressive divinity. If the goal, the divine (Kantian humanity) to progress towards is the infinite road of progression itself, you have nothing to judge what is the right road or not. A man may be progressing from a wrongness to God, provided there’s some faith in the divine, but what is a progressive God progressing towards? What defined the Civil Rights movement of Dr. Kings contemporary was not just that all men are equal Constitutionally, but all men are equal in a way which far transcends any government document—in that all men are equally created by God, and in the faith of God as Father, none of his children—nor his creation for that matter, has earned the right to be stripped of liberty, of freedom, and of justice. This is not to say that persecution was something to fight against, but King would say to fight through. Dr. King saw persecution—tribulation, as a worthy battle to fight through, all the while resting in the hope of something greater. It was better for him to admit a limit of freedom in existence, if only to be free to progress towards something true, than it was to have the “freedom” to flounder in whatever way “the progression of mankind” deemed appropriate. Sometime during the Spanish Inquisition, Miguel De Cervantes stood trial amongst his fellow inmates, merely because—well, because no one enters or leaves this or any prison—without being tried by his fellow prisoners. His charge: being an idealist, a bad poet, and an honest man. His plea: guilty of all charges. Of being an idealist, yes; for he never had the courage to believe in nothing. His defense, to spin a tale of a knight so daft that he fought what others could not see, for a cause which others did not believe in. For the sake of itself? The knight strove to reach the unreachable star. to be willing to march into hell for a heavenly cause! Time may be the only thing to prove man right or wrong. We may progress to a time of starships, and of contact with sentient extra terrestrial beings; of aliens who have progressed themselves to a life of logic and suppression of emotion, to explore new worlds and strange civilizations; yet time will still be the Geiger of measurement if there is no God, if the divine is ever progressing as we are, if the cause is to move past the past, and on toward the future, time will prove man right or wrong. For who knows what mysteries one may discover, come the future of knowledge, of progression? Will men like Hitler actually be proved right in his actions? Will Gahndi be proved wrong? Will the future’s heroes of the past sift and waver between the moral boundaries we at present hold them in? Time may be the only thing to prove man right or wrong. But perhaps man—man may become the only thing to prove God right or wrong—or rather, to prove there even is a right and a wrong. Materialism says that the universe is mindless; and faith says it is ruled by the highest mind. Neither will be satisfied with the new “progressive” creed, which declares hopefully that the universe is half witted. In the end though, I would rather fight for the right (without question or pause), than for my rights.